Organizing your finances and finding ways to free up some of your money for an emergency will help you create a personal safety net. Theses five tips and suggestions will help you get on the path to financial freedom. 4. Start slashing the budget. Start eliminating the budget busters and nonessentials. Do you really have to get a four dollar coffee at the high end coffee house on your way to work? By cutting this small indulgence, you will save over a thousand dollars a year! In an article by The Organic Prepper, she explains how cutting the budget down to the essentials can save you lots of cash. The emergency fund came in handy a few weeks ago when our washing machine crapped out. Luckily the appliance stores were running July 4 sales. We got a new washer (and dryer, to replace the one we’d owned for nearly 30 years) for under $1500. We also got a year’s financing at 0%, further reducing the hit to the fund. Tip #1 is the most important. We paid off the mortgage 18 months ago, which allows us to grow the emergency fund quicker and gives us peace of mind. I bought my washer and dryer in 1990.They are still working, but I wonder about the energy savings a new set would bring to my already low use of electricity. Gold and silver are money too, and a permanent store of value. They should be owned for the day when paper money loses its (artificial) value. 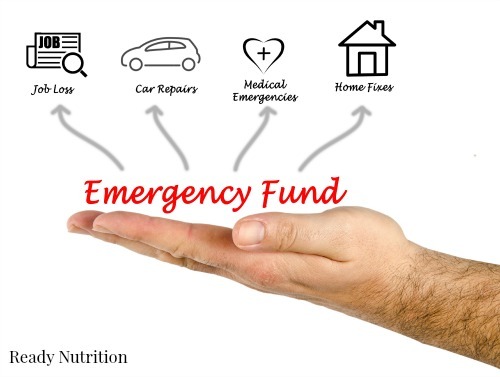 I’ve been saving $20.00/wk sometimes more and putting it in an Emergency Fund. We’ve cut our budget. Bagged lunch instead of fast food. No car payments (both vehicles are paid for). Trying to pay off credit cards. One down, one to go. #6: Rob bank, have get away plan.